I’m tired of winter and adding a touch of spring decor. I can’t think of anything that reminds me more of spring than bird’s nests and daffodils. So I added a bird’s nest to my coffee table. More about the daffodils farther down. Not only do I have a green theme going in my living room, but the bedroom has the two green dressers on either side of my bed. I also have green cushions in the chairs on my patio. If you live in a small space home, using one or two colors brings unity and draws the eye through the space. Continuity is good. It makes your space seem larger. If you sprinkle every color in the rainbow through your small space home it may be pretty, but it will often look and feel cluttered. 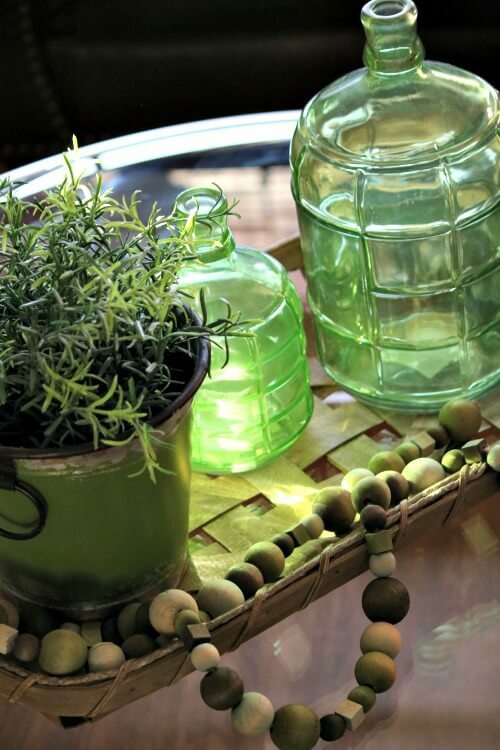 I like the way the green coffee table vignette bring shadows and light to the glass coffee table. I have even more green decor scattered about my living room. In the curtains and framed photos and paintings on the wall. Green and blue are my favorite colors to use in a room, with a sprinkling or red and yellow/gold. Paint Tips: Did you know that the smaller the space, the darker paint color you can go? Painting a room a dark color actually camouflages the fact that it’s small. Deep blue or green paint creates the perception of depth. Another great idea is to paint the walls and trim the same color in small rooms. This way your walls seem taller. Therefore the room seems larger. 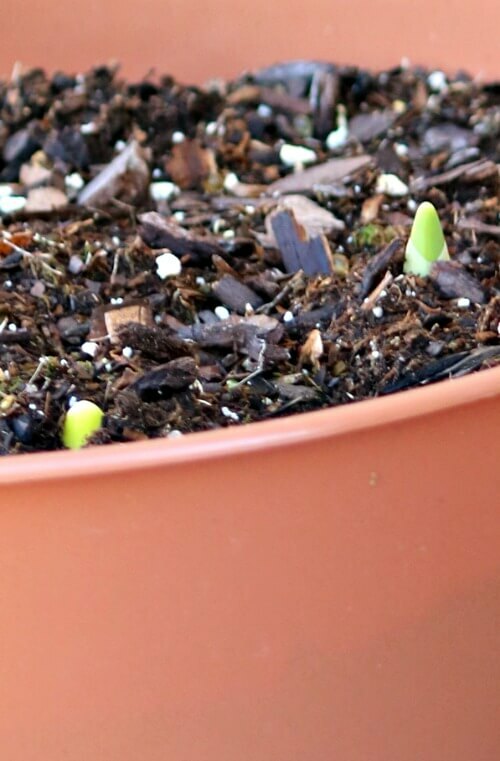 I don’t know about you, but I have daffodils peeking out of the soil. Poor things. They’ll probably freeze before I see them bloom. Daffodils are usually the first harbingers of spring. But I think they’re a bit mixed up. We’ll still have cold weather. And freezes. 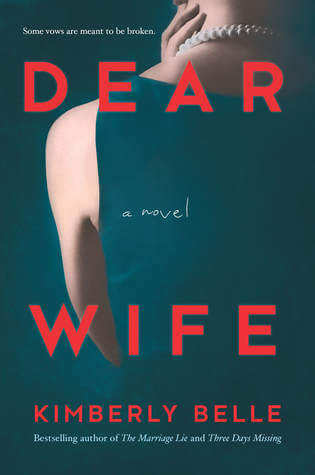 I told you the other day that I was reading “Dear Wife.” Well, it was one of the best books I’ve ever read. I kid you not. It was one of those books where I kept rereading pages over and over again. It had a plot twist that occurred late in the book that I sure didn’t see coming. Like Oh.My.God. What just happened? I cried toward the end. Not because it was particularly sad. Domestic abuse is sad to begin with of course. But this book is more about women finding their strength. I am woman, hear me roar. One of those books that finds the woman outwitting her abuser. I wanted to cheer for her. And I wanted the book to keep going. I certainly did not want to part ways with her and say goodbye. If you want to watch a woman bloom before your very eyes, you need to read this book. Women helping women. That’s what this book is all about. When there doesn’t appear to be a road out, start digging your own pathway. This book won’t be out till summer, but I’d run a copy down when it comes out. Expected publication: June 25th 2019 by Park Row. Yesterday Charlie never drove me crazy about his daily egg. I had to break down and give it to him around noon. Of course then late afternoon came around and he wanted another one. I don’t want to make him fat. But he acts like he’s starved lately. So of course he got another one. Ivy’s just as bad. They’re both terrible beggars. Shameless. And they know Mom’s a pushover. I’ve got to make an appointment to get this boy groomed. I attempted to do it myself a few times and the poor boy looked like he’d barely escaped a collision with a shark. For $35 it’s just easier to let the groomer do it. I’ve been using her since I moved to Tulsa and she’s such a dear. Speaking of appointments I’ve got one in the morning with my accountant. Going to pay those taxes. Get it over with and call it done. Thank goodness things have worked out as they have. How about we discuss frugal gardening tips on Friday? Someone mentioned they needed some tips about gardening, so let’s do that. Another person mentioned that we’re likely going to run out of frugal topics before long. We might, but let’s keep going as long as we can come up with topic ideas. I sure enjoy learning from all of you. If we have to do a bit of a switch at some point, maybe we can broaden the topic to homemaking tips. Thoughts? it sure felt strange not posting yesterday. If I can get this pain taken care of, I’ll revisit the schedule. I’m not doing any better this morning so maybe this isn’t the answer. But for now I’m resting my poor body. It’s all I can do to use a fork to eat. I’ll see my internist next week for one of my twice a year checkups, so I will talk to her about this. I sure want to be able to get my gardening game going in a few months. See ya Friday! Bring your tips. 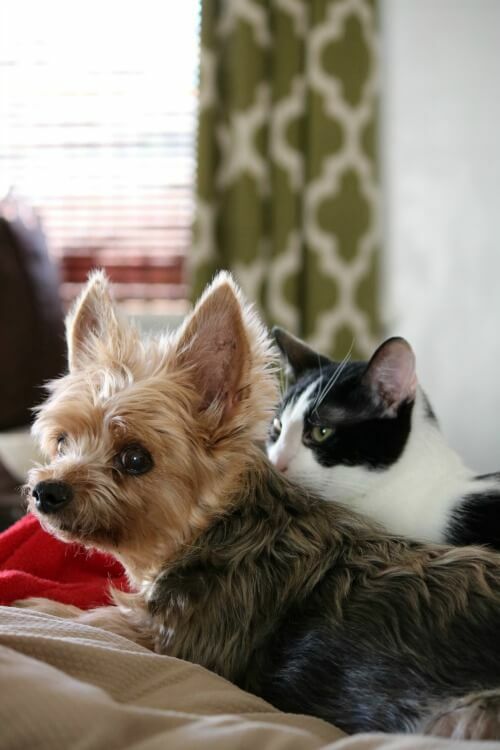 Such a sweet picture of the fur babies together……. I busted out laughing when I read about your attempts at grooming !!! lololol…. that green vignette on the coffee table is gorgeous !!! Love that …. Have a blessed day .. and thanks so much for sharing !! I have pics on here somewhere where I “groomed” both of them. Looks like I took a buzz saw to them. 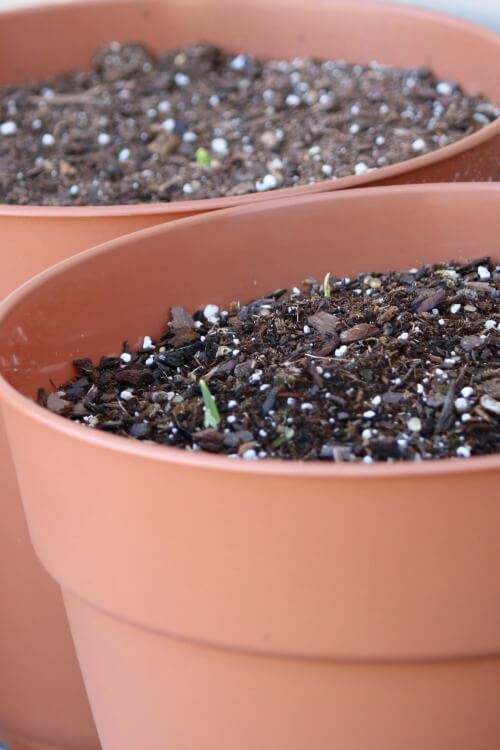 I have some pots of bulbs in the downstairs fridge and they are about 3″ tall poking out of the soil….I’m holding off bringing them upstairs until the Amaryllis blooms – I’m stretching out the flowers to keep me going until spring! Meanwhile we’re buried in snow and ice once more, which makes spring feel like an eternity away. 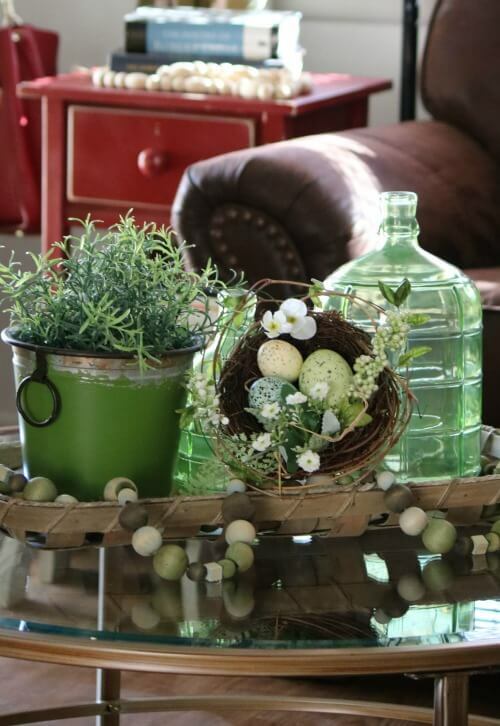 Love the green vignette, beautiful! Do you have twinkly lights in there for evenings? Are you kidding? With Ivy? Green just reminds me of spring! Love your touches of green throughout your home. I’ve always thought about having a blue and white home. Looks like it’s green though. Then we shall do them. Dear Wife book is not available at my library, so I put in a request. It’s sounds good. I try not to buy books and use kindle or audiobooks from my library. I have a library and have donated around 200 books to the local library and the Ruritans, a volunteer charity around here. My downsizing makes me more cautious about what comes in the house. The ipod and iphone with its ability to store books has been one of the best things to happen to me in the last few years. Technology has its good points. Charlie looks like an extra egg wouldn’t hurt him and he is sooo cute. And Ivy is a growing girl. It has to be hard to deny them. That photo of them is so too precious. Such little beings. Do you take Vitamin D? My iron levels are low so I have to be careful about that. Could that be affecting your joints, etc? They’ve had me on Vitamin D ever since my ankle accident. Twice per day. The book doesn’t officially come out until summer. I get them very early. Charlie and Ivy resting together! So sweet. They warm my heart. Good luck at the accountants, so happy that a load has been lifted off of your shoulders. With all of the other stuff in your life you do not need any more stress. I can think of several frugal topics, “frugal reading”, frugal entertainment, frugal parties, frugal style, frugal health and wellness, frugal education, etc. I’ll write these ideas down where I keep possible topics. Love your touches of green in your living room. I am waiting on my sectional to arrive and then will begin to bring out some spring decor to the spaces. Even though it is still cold and snowing outside I feel I need a little warmth and spring like setting inside. Little Charlie and Ivy are adorable together. PS: That sounds like a great book. I was thinking of you yesterday. I thought I bet Kris is counting the days until Saturday. Your spring vignette made me smile. I am so ready for warmer weather. I love it when you sprinkle home decor throughout your posts. It inspires me to make the most of my small space. I miss you each day, Brenda, but I know you need to take care of yourself. See you Friday!! If this doesn’t help I may be posting more. As long as we have topics we’ll have Frugal Fridays. Brenda, I have attempted to trim Kaia and she looked like she had been in a shreader! My brother pays the groomer what you pay. We pay $70.00 with tip at petsmart. In the past a young girl would groom Kaia out of her home. She is too busy with her little ones to continue that side hussle. As with all good things that have gone away, I am just glad that I had them to begin with. I am blessed. I get dogs begging for people food but read somewhere people and I’m sure animals also need more calories in the colder months. Just hung my bedsheets and towels outside. Love the smell of fresh laundry! We are just south of the ice and snow in Maryland! Have a great day!!! Seventy dollars for one dog? I always tip $5 to both the groomer and the girl who cuts my hair. Vet bill was $208.00 for 3 shots,exam and bloodwork. Kaia is 10 and has no health problems. Every time we take her to the vet they quote me a price of close too $1,000 for teeth cleaning. That is bloodwork, putting her to sleep and depending on what is found, extractions. I have been putting this off but the reality is she could have problems. Right now my husband is on the phone with another vet.The price is only a few hundred so she will be getting a teeth cleaning in two weeks. You really can’t tell how much it will cost depending on what they find and I know cheaper is not always better. I wonder if dog grooming costs more for fancy dogs. She is a coton. We laugh because she was a free dog given to us as a puppy from a litter across the street! Monday I decided to make some changes in my living room. It is very small and not much light. It takes me a lot of thinking to make a change. I live in a single wide mobile, so can’t do a lot. There is a built-in book shelf which I am going to paint on off white. That will brighten up a dark corner. 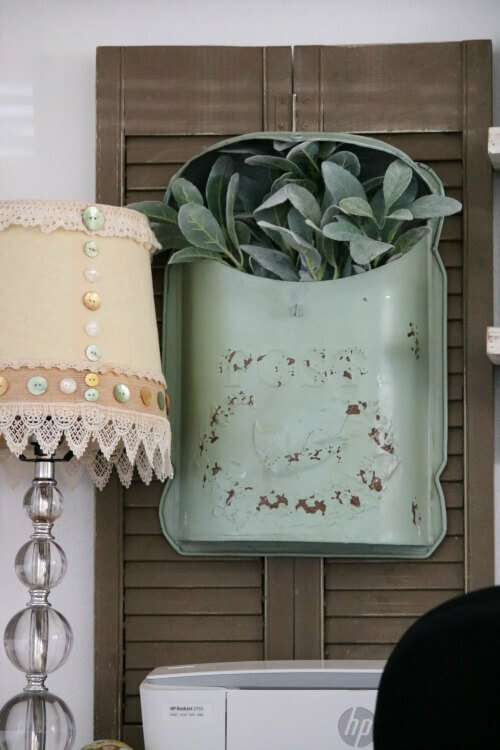 With some of the ideas I have gotten on your blog I will decorate with small plants and some rustic items I have collected. I am so ready for spring and the sun. We have not had the bad weather the East has had but we did have some snow and heavy rain the last 2 weeks. Love the pictures of Charlie and Ivy. Charlie looks so cute and Ivy looks like she is always looking for something to get into?? Praying you will find some help for your pain soon. I feel it’s always good to make some changes. Makes things fresh. We have not had dogs who would have chosen to lay so close as Ivy and Charlie do…that is amazing. Maybe Ivy is not really aware she is supposed to be leery of dogs. Ha! Very cute photos of them. Love all your decor ideas…you could so easily be paid for all those ideas!! Hope you feel better soon…for sure, we feel more aches and pains during these snowy days…winter cold seems to bring on the pain!! Neither Charlie or Ivy seem to know that cats and dogs aren’t supposed to mix! Charlie and Ivy look cute together and what little piglets they are! Molly would eat 24/7 if she could; I just don’t know where she puts all the food. I love daffodils and picked a bunch this past weekend in a yard where the house is abandoned. I’d love to go back and pull the plants up and replant in my yard. I agree with you, I think we have had some warm days that is just confusing Mother Nature. I’m glad you see your doctor in a couple of weeks and glad you can go ahead and pay those pesty taxes. Rest up and look forward to talking again on Friday. Here in central MN we are having the #10 snow amount on record, but I am also tiring of the weather. This weekend the snowpeople and assorted related decorations will be put away for another season. A bit too early here for actual spring but changes are in motion! Today it’s in the 60’s here. I just took my two Pomeranians to Petsmart for grooming yesterday: $150.00 with the Furminator treatment because of their shedding (I have COPD/asthma pretty bad). Yes I do this every other month. It really is a financial hardship but they love their groomer and she does a great job with them. Maybe you could do Frugal First Friday once a month rather than weekly? I do enjoy it a lot and hearing from other readers is nice. It’s important that they’ve bonded with their groomer. So whoever they like. We are weather bound for the second day in a row, but I am not complaining. Spending my days organizing and crafting. I look forward to your posts whenever you are able to do them….truly a blessing! Those furbabies are just so cute! It truly doesn’t matter what you write about …your blog is always fun, informative, and enlightening! Your health is of the most importance, so post when you are able! Nice here today aside from the wind. So for it has worked for. We must try to remember all of us react differently to any drug. That’s true. Drugs affect everyone differently. How about tips on home-made cleaners for around the home? Vinegar/baking soda is about all I use now! Didn’t we already do that? I’ll have to check. I love the green! And you are right about the small room and darker paint. When my boys were teenagers I allowed them to choose their own paint colors for their bedrooms. One chose navy and the other choose a beautiful teal color that had some black in it. It didn’t make the rooms seem smaller like I expected, it was just the opposite. Oh, you’re so sweet. I’d love to paint a room navy sometime. Brenda, I love your spring touches! I’m ready to start adding a few here and there myself. I’ve always heard that about dark colors, but have never tried it. I’ve always leaned towards an accent wall with a dark color or keeping the whole room lighter. Hope you are having a great day! Love and hugs! Me too. Haven’t stepped outside my comfort zone with dark walls yet. The nest certainly does remind one that spring is not too far away and those little speckled eggs are just beautiful. Hopefully your daffodils will make it to springtime. They have a way of making the landscape look cheerful; since they tend to be the first flowers to bloom, they give that hint of good things to come. 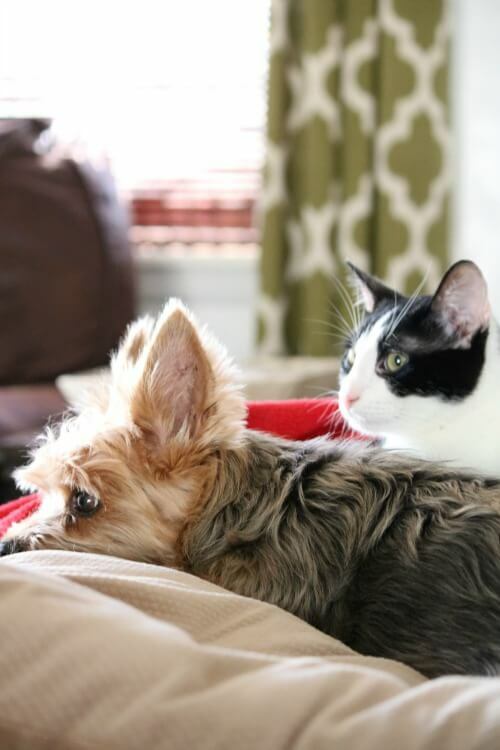 The photos of Charlie and Ivy are great; they look like best buddies (at least in those photos). This summer, I will for sure be looking for this book to read. I do not know how it could get a better review than the one you gave it. Thank you for the review. Give yourself a little more time to heal — you have just started this new schedule and it probably much too early to tell if the reduced blogging is helpful. We are a patient bunch and will be eagerly waiting on Friday’s post. Oh, I will give it time. 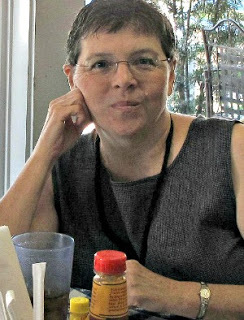 Here’s a Frugal Friday suggestion: Brenda, you post all the Frugal things (or the top three, or whatever amount you choose) you have done the week prior. We comment in kind. Everybody shares! That way we see what someone else did — something we wouldn’t have ever thought to ask or have considered! There are things that we all do that are so habitual that we don’t consider them worthy of sharing. Plus it makes it kind of a game between all of us and the “oh I have to tell Brenda this” factor makes it fun! Beautiful green decor! Love the picturesque Charlie and Ivy! How about a frugal Friday topic on decluttering? Like how best to let go of things. Would like to hear others suggestions. I sure hope you get some pain relief soon. Chronic pain is draining. At least there is only 78 calories in a large boiled egg. And it’s not like you’re handing out treats to them, which would surpass that fast. You are such a wonderful mom to Charlie and Ivy. 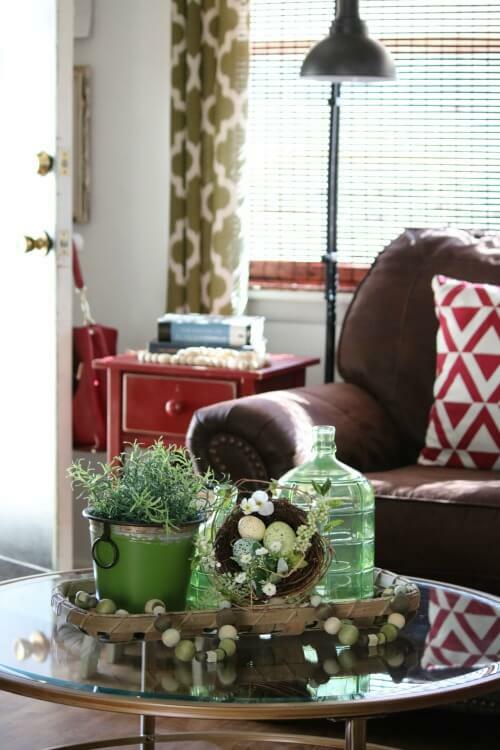 Love your touches of green on the coffee table. I am SO sick of winter but there is absolutely no sign of spring in sight here in IL. We keep having snow, then ice, then rain and hail, then more ice, then 50 mph winds. Oh – and we had sub-zero temps in-between all that, too. Sure hope you start feeling better soon – pain is no fun. I deal with it daily and have for years. Life goes on – yeah. I will definitely read the book when it comes out. My sister in law says I should write one , told her it would be too boring. Love your coffee table vignette – would you mind sharing more pictures? I flipped over your cabinet doors !!! Fur babies are so loving, forgiving and funny. Take care. So good to get your post. The touches of green are inspiring but I must admit I am not ready for all the work springs brings. Some of the surprise lilies are already up about four inches. What? It is too early. The photo of Charlie and Ivy together is so sweet. Please continue to rest, Brenda. It might take a while for the good effects to come about. And two eggs for Charlie? A good appetite has to be a good thing! When my daughter was small, I cut her hair to save money, thinking a little kid wouldn’t mind. Well, I’m not trained at this sort of thing, and her hair was very asymmetrical! We look at her pictures now and we can laugh about it. But she goes to someone that knows what they are doing now! The daffodils are out in my yard; but I do live way down south. I’ve got a nice bumper crop this year but can’t bring them inside as I’m very allergic to them. The camelias are also starting to bloom, along with the forsythia. That happens around here in mid-February. Spring is coming everyone! Yes, please keep going with the Frugal Fridays. And if you run out of topics, your homemaking idea. We all have homes to run. Brenda, I am in need of a coffee table, but I don’t want one which will take up visual space. I think that I need one with a glass top similar to yours. Do you mind revealing your source? I did miss you yesterday, Brenda! But I’m still glad you are taking some time off and resting your hands. I think Frugal Fridays once a month would be fine if we run out of ideas on frugality. It would give us more time to collect frugal ideas. The coffee table arrangement with the nest is pretty. I like it for underscoring the idea that Spring will come in good time. Even though I, too, am chomping at the bit, impatient for those daffodils to bloom along my driveway. I’ve always read and heard that dark colors on the walls of a small room make it look bigger but I’ve always been very skeptical about it. I thrive so much on light that I’ve never tho’t I would like it. I like some bright or dark colors in my rooms but when I think of something dark on my walls I think it would feel like they were too much “in my face” or closing in on me. Guess I’ll never know unless I try it! Never say never! ‘Til Friday! Happy Valentine’s Day tomorrow! Love the touches of Spring – it’s my favorite season.